Following on from my rave review of the Origins High-Potency Night-A-Mins cream I wanted to share with you a new eye cream which Origins have just launched this October. 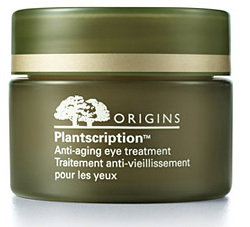 Plantscription Anti-Aging eye treatment helps reduce the 4 signs of eye aging. If you've just started to notice crows feet or fine lines appearing then quick run out and pick one of these up to help minimise and keep them at bay! The cream is formulated with Anogeissus tree Bark as well as Kombucha (fermented Black tea) and helps repair the appearance of lines and wrinkles, crepey lids, under eye cross hatching and saggy eye area. The cream also helps restore elasticity making the eye area appear more youthfu. In addition, we have tested Plantscription™ Anti-aging eye treatment in a sensory evaluation. Kombucha (fermented black tea), Scutellaria, Magnolia and essential oils Mandarin, Star Anise, Pink Rose, Lavender and Geranium. I know this would be a product which I would be interested in, especially with me hitting the big 30 next year I am becoming really conscious about my skin and the appearance. The texture is like a cream-gel and is suitable for all skin types so everyone can enjoy the marvels of the product! Does the Plantscription Eye Treatment appeal to you?